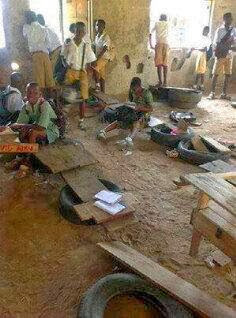 Believe you me this is a recent picture of a primary school in Nigeria. How can children assimilate properly in this kind of environment? This is the same thing parents all over Nigeria go through if they can’t afford expensive fees of private schools. The classroom is very painful to behold. Jonathan must see this. This is even better than some schools in Ibadan. GEJ IS NOT THE CAUSE AND WONT BE THE SOLUTION TO EVERY WAHALA WEY DEY THIS COUNTRY O. WHAT HAPPENED TO OTHER LEVEL OF GOVT I.E. THE STATE AND LOCAL GOVERNMENT? WHAT IS THEIR ROLE IN FACILITATING QUALITATIVE EDUCATION AND QUALITY OF LIFE FOR NIGERIANS? not better here, children playing ground are better than this ,no place to sit, no table to write,but few nigeria in power are building might houses, buying private jets, sending their family to school, live and go to hospital in overseas, when majority of nigeria are dieing small small.abeg my people let us for full force togther, forget about your tribes and religion to bring down all this bad govt, take back all their things in nigerian if possible in all part of the world, when we removed them in power.and bring it back to our father land for the poor,make new law, anybody steal with pen will sent to die by hanging, we will see many will think twice b4 jumping into political things,cos no more pen sign and take all away and walk free law. How real is this picture,what’s the name of the school,how many school uniform do they have. when is Nigeria going to be better, what is our so call politicians and govt doing about the future of this great country if our children are learning under such dilapidated buiding, do they have plans for the poor in the society, during election time the will bring out money to buy the minds of many people instead of using it to help their community in oneway or the order, when the finally enter the will forget all the promises they made during campaign, what type of teaching are we expecting from their teachers or what do we expect from pupils from such schools, we still have a long way to go. MR PRESIDENT MUST SEE THIS BCOS 2015 IS AROUND THE CORNER. SHAME ON PRIVATE JET OWNERS, THE SO CALLED MULTIMILLIONAIRES AND FLASHY HOUSE OWNERS AND THOSE “DR” THIS AND “DR” THAT, THE PRESIDENT HIMSELF HAS NO RELIANCE ON THE HEALTH SYSTEM AND HAS TO GO TO UK JUST FOR MEDICAL CHECK UP, HOW MANY OYIMBOS TRAVEL TO NIGERIA FOR MEDICAL CHECK UP? YET NIGERIA IS A GREAT NATION INDEED!!! That is not so in Ondo state, Big Bro( Mimiko), has done excellently well when it comes to education. what is this,this is bad ooo is the governor of this state sleeping or busy rocking girls,for the sake of this kids they have to do something about this situation. Nigeria is a finished and hopeless nation. Shame on all politicians and the so called Dis-honorable s and Dis-excellencies. The steal and send our money to the Western world for education and betterment of Western ideologies while our young stars languish in abject poverty. May the Creator punish all of them.